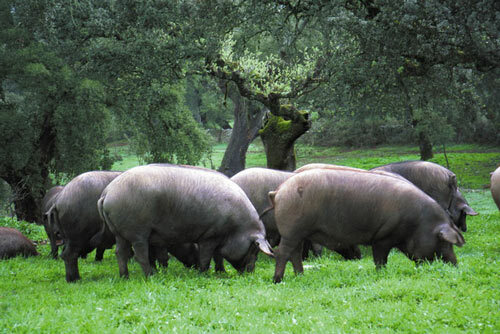 Iberian Pigs are meat pigs from to the Iberian Peninsula. The Iberian pig can probably be traced back to the Neolithic, when animal domestication started. Currently they are found in herds clustered in the central and southern part of Portugal and Spain. The most commonly accepted theory is that the first pigs were brought to the Iberian Peninsula by the Phoenicians from the Eastern Mediterranean coast (current day Lebanon), where they interbred with wild boars. This cross gave rise to the ancestors of what are today Iberian pigs. The Iberian breed is currently one of the few examples of a domesticated breed which has adapted to a pastoral setting where the land is particularly rich in natural resources, in this case acorns from the holm oak, gall oak, and cork oak. The numbers of Iberian Pigs has been drastically reduced since 1960 due to several factors such as the outbreak of African swine fever and the lowered value of animal fats. In the past few years, however, the production of pigs of the Iberian type has increased to satisfy a renewed demand for top quality meat and cured products. At the same time, breed specialization has led to the disappearance of some ancestral varieties. Iberian Pigs have a good appetite and temp to be very fat, they have a great capacity to accumulate intramuscular and epidermal fat. The high intramuscular fat content leads to marbling; and this, plus their feeding based on acorns, makes for especially tasty meat. Iberian pigs can be either red or dark color colored, if black ranging from dark to grey, with little or no hair and a lean body, thus giving rise to their familiar name pata negra, or black hoof. In traditional management, animals ranged freely in sparse oak forest (dehesa), they are constantly moving around and therefore burn more calories than confined pigs.